By the time December rolled around, I was scared of the IUI, but ready. Almost craving it! I religiously took 150 mg of Clomid at the EXACT same time days 3-7 and then started the opk's a few days later. On day 21, I got the smile face and I made the call. My little sister Heidi had just moved back from Mexico and came with me for support. She joked that she was going to tell the future niece/nephew that she was in the room when he was conceived. We arrived to the hospital at 7:oo am the next morning. Darren had to go into a room to deliver the goods while Heidi and I waited patiently. 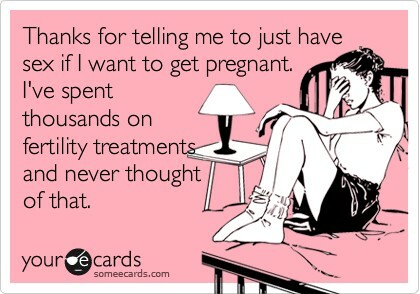 They then "wash" the sperm and you have to wait an hour before the IUI. Finally they called my name. I was really really nervous. The nurse was friendly and wanted to talk a ton (in my head I was like, get this OVER WITH). The unknown is so creepy and just thinking about what she was going to do to me. The process wasn't comfortable but over fairly quick. I had to lay there for 20 minutes. For some reason I kept ovulation testing. 4 days later, I got another smiley face. I had gone in too soon. The first one was a "false positive." $200 later, we went in again on New Years Eve. Since it had only been a few days, the sperm count was much lower but I was more mentally prepared. Blood test a week later showed my progesterone level was high. One more week to go. I started feeling pregnant. I was convinced I was craving artichokes. However, I started spotting with a period following 15 days later. There was peace in knowing we had done all we could, and that God himself had chosen to say "not this time." But still heartache in feeling so close. The next month I did the same exact thing, went in for IUI #3 (February 2012) the same exact time, and found out I hadn't ever ovulated at all! Talk about going backward. Dr. decided to put me on Femera (used for women with breast cancer) and newly found to make women ovulate. You're Going to Put That Where? Clomid Sounds Great, Maybe We'll Call Her Chloe!